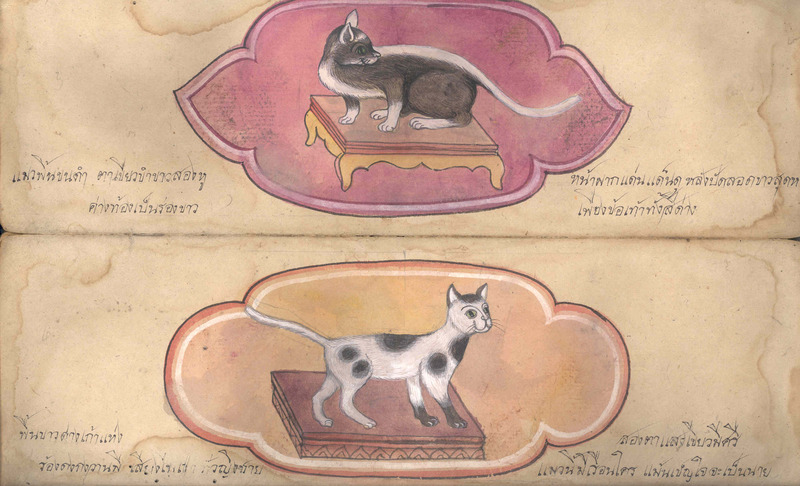 A Thai Treatise on Cats (Or.16797) has recently been digitised and made available online by the British Library. The original manuscript containing fine paintings of cats was brought to the library in February 2011 by the wife of an elderly manuscripts collector in the UK. The manuscript could easily be identified as a Treatise on Cats, similar to one manuscript already in the library’s Thai collections (Or.16008). However, the significant difference between the two manuscripts is that the illustrations in the newly acquired item are watercolour paintings on cream coloured paper whereas the other manuscipt contains drawings in white chalk on blackened paper. The newly acquired Treatise on Cats has the format of a Thai folding book (samut khoi) with 12 folios, which open from top to bottom. It was produced in the 19th century in Central Thailand. Folding books were usually made from the bark of mulberry trees, whereas minerals, plant liquids and occasionally materials imported from China and Europe were used as paints. Sometimes the paper was blackened with lamp black or lacquer to make the paper stronger and more resistant against damage by bugs or humidity. The text that accompanies the 23 paintings is in Thai script which, at that time, was mainly used for the production of non-religious manuscripts in Central Thailand. The rather short captions give descriptions of the features of different types of cats that were known in Siam. For each type of cat there is also a note what effect keeping this cat could possibly have on its owner. Unfortunately, as it is often the case with Thai manuscripts, neither an author or illustrator, nor a date is given in the manuscript. There was a tradition in 19th century Siam to produce treatises on animals which played an important role at the royal court and monasteries. Among such were first of all elephants, particularly albinos, but also horses and cats. The breeding of the famous Siamese cats, for example, was originally reserved for the royal family alone. Certain cats also were believed to be the “keepers” of Buddhist temples resulting in this cat being closely guarded and highly revered. There was a strong belief that certain types of cats could bring good luck, prosperity or health to the owner, whereas other types of cats were regarded as unlucky animals to be avoided. For example, a white cat with nine black spots, auspicious green eyes, and a strong and beautiful voice was regarded as a lucky cat. It is said that however poor the owner of this cat is, he or she will become a respected person and gain a high social status.